Courtney Burke is a Regulatory Compliance Manager with Perr&Knight. In this capacity, Courtney manages a team in Perr&Knight’s State Filings Unit, ensuring best practices and regulatory compliance. In addition to State Filings Services, she manages Perr&Knight’s Bureau Monitor Service, overseeing all activities, including the monitoring, tracking and analysis of circulars and bulletins from pertinent property & casualty and workers compensation insurance bureaus. Courtney also works with Perr&Knight’s Product Design area assisting with product development, form review, competitor analyses, regulatory compliance guidance and form filing support for property and casualty products. Prior to joining Perr&Knight in 2016, Courtney worked in the insurance industry since 2005 and started her career as a Homeowner Claims Representative for Ameriprise Auto and Home Insurance. She spent five years at Jewelers Mutual Insurance Company as a Regulatory Compliance Analyst managing countrywide form/rate/rule filings and drafting policies and endorsements for personal and commercial lines products. Also, as a Law Specialist, Courtney negotiated contracts and provided compliance guidance with regard to claims, underwriting, and corporate operations. 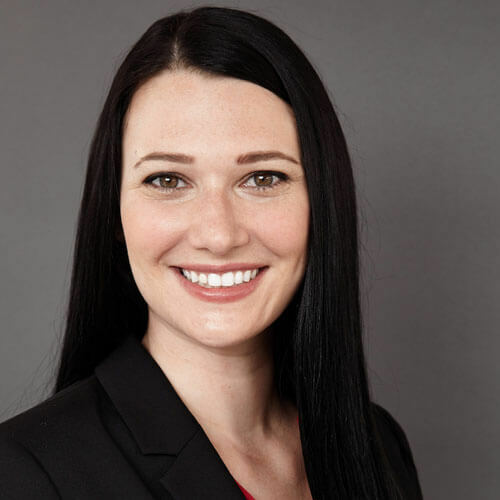 Courtney was a Policy Wording Specialist at American International Group (AIG), where she reviewed and edited manuscript policies, drafted manuscript endorsements for both admitted and non-admitted products and provided policy wording training to underwriters. Courtney graduated from University of Wisconsin – Eau Claire with Bachelor of Arts in Political Science and a minor in Business Administration. She subsequently received her Juris Doctor (J.D.) from University of Wisconsin. Courtney has also earned Associate in Regulation and Compliance (ARC) and Chartered Property Casualty Underwriter (CPCU) designations from American Institute for Chartered Property Casualty Underwriters.